After the announcement on Wednesday about the Treasury Department’s decision to replace Alexander Hamilton with a woman as the face of the $10 bill, while leaving Andrew Jackson on the $20, I thought it would be appropriate to briefly compare these men’s respective legacies in terms of the financial system. As the first Secretary of Treasury, Hamilton was the architect of creating a national financial system and establishing the constitutionality of a national bank. Hamilton faced an uphill battle, with ardent opposition from Jefferson and Madison, and a lukewarm reaction from President Washington. However, he cajoled, persuaded, and politicked in order to birth the new financial system. “He made your Government! He made your Bank. I sat up all night with him to help him do it. Jefferson thought we ought not to have a Bank, and President Washington thought so. But my husband said, ‘We must have a Bank.’ I sat up all night, copied out his writing, and the next morning he carried it to President Washington, and we had a Bank. 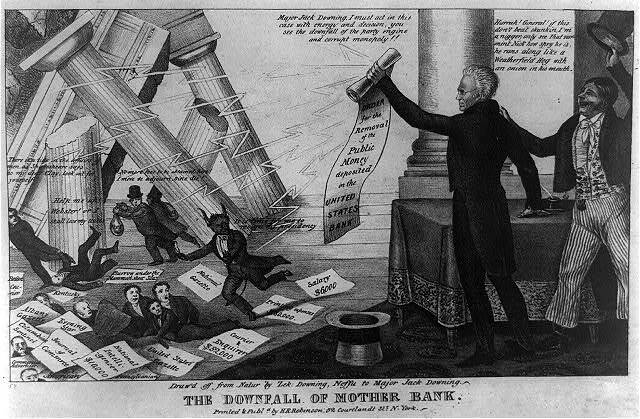 Hamilton believed that a national bank would help establish public credit and place the new nation on the solid footing that would be necessary to secure its future. The tendency of a national bank is to increase public and private credit. The former gives power to the state for the protection of its rights and interests, and the latter facilitates and extends the operations of commerce among individuals. Industry is increased, commodities are multiplied, agriculture and manufactures flourish, and herein consist the true wealth and prosperity of a state. He clung to this opinion despite significant opposition, and established the federal debt and the national bank through sheer force of will. The financial system that Hamilton set up during his tenure as Secretary of Treasury outlasted him and left a legacy that shaped institutions for years to come. The present corporate body, denominated the president, directors, and company of the Bank of the United States, will have existed at the time this act is intended to take effect twenty years. It enjoys an exclusive privilege of banking under the authority of the General Government, a monopoly of its favor and support, and, as a necessary consequence, almost a monopoly of the foreign and domestic exchange. The powers, privileges, and favors bestowed upon it in the original charter, by increasing the value of the stock far above its par value, operated as a gratuity of many millions to the stockholders…. In light of Hamilton and Jackson’s respective impact and beliefs on the financial system, replacing Hamilton while leaving Jackson on currency is highly problematic. Removing the spiritual father of the Treasury Department while continuing to allow one of its sworn enemies to retain a place of honor shows a blatant disregard for history.